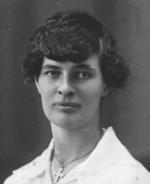 Agnes, as she was always known, was born on ‘Heaslips’ farm near Wirrabara on 19th April 1897. Her parents Peter and Wilhelmine Zwar lived there for the first five years of their marriage. Agnes was their second child – she had an older brother Hermann – and she was their first daughter. Her grandmother Magdalene Zwar was the midwife – as ‘Lena’ was for all of her grandchildren, and Agnes was named after her. Twenty months later a brother Alfred arrived. The following year the family moved to ‘Kentish’s’ farm between Caltowie and Stone Hut. When Agnes was nearly three years old her mother was expecting their fourth child. Her grandmother Magdalena had come to help with the family and the delivery. 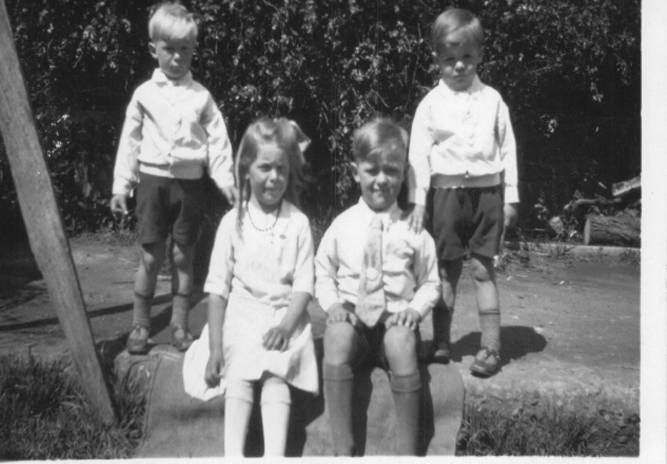 On the 8th of April, a day when her mother Wilhelmine was not feeling well and had gone to bed to rest, Agnes and her two brothers Hermann and Alfred went to play among the fertiliser bags stacked in the straw roofed shed about 35 metres from the house. In a tragic accident a bag fell on Hermann and Agnes was trapped up to the waste [Agnes to K. Z. ]. Agnes and Alfred were O K but the bag of fertiliser had broken Hermann’s neck and he died on the spot. Their grandmother Lena had come out to check on the children and furiously dug Hermann out from under the fertiliser and discovered the tragic death of her grandson. None of the men were home at the time. The shock for Wilhelmine was so great she went into labour and Oscar Traugott Zwar was born the same day. Oscar would only live for 13 days. Agnes had lost two brothers in two weeks. Agnes would now be the oldest child in the family. Her sister Marie came when Agnes was nearly five years old, and another brother Edgar arrived when Agnes was six years old. Albert Nayda lived in an old hut on their farm as a farm worker for many years. He never married. The children liked him. He used to help them with their schoolwork. “Father worked from morning to dark. He preferred the blacksmith work to the farm work. He had a licence as a wheelwright and blacksmith.” [Sisters Agnes and Marie]. “We had lots of cows to milk by hand – about 8 to 12. The horses to feed,” recalled her brother Edgar. At the same time they helped various families in the district as help was required. The girls had to help with farm work too, like pumping the bellows in the blacksmith, and helping out with the harvest. “We worked stooking sheaves of hay, loading them, and carting the wheat,” Agnes and Marie told Kevin Zwar. A highlight of the year was the Church Picnic, held in the early days down from the Lutheran Church near the Pine Creek crossing. Some days Agnes would go to Grandfather Peter Zwar who lived alone in his final years – he lived to age 93. He lived on the same property near Wirrabara where Agnes had been born. One task was to boil seven eggs and place them in a rack in the kitchen so grandfather could enjoy a boiled egg each morning for breakfast. They did their weekly shopping at Laura, where Agnes and Marie took music lessons on the organ from Mary Dack but soon the teacher moved away and lessons ended. Alf was the first married. He married Jane Borgas (1924) and they lived on the Zwar farm where Alf had been born near Wirrabara. The following year Agnes married Emil Borgas on 25th June 1925 in the Pine Crrek Lutheran Church near Appila. They lived on their farm near Wirrabara, and quite near the Zwar farm where her married brother Alf now lived on the farm where Agnes had been born 27 years earlier. 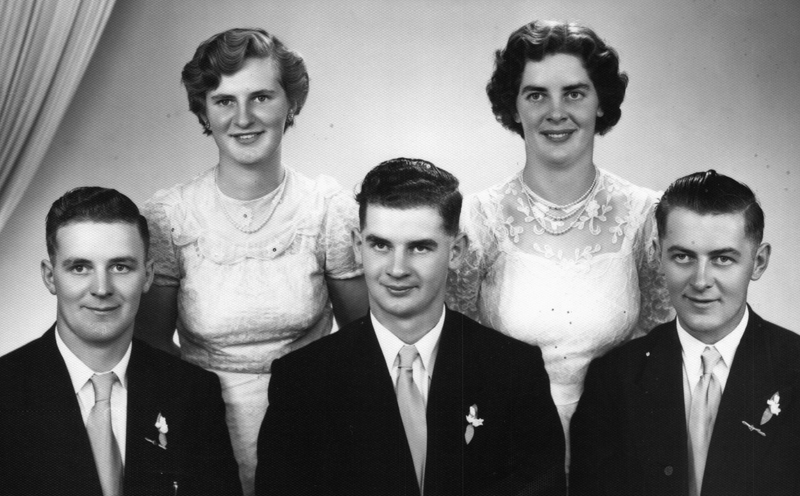 Agnes and Emil started the family with a set of twins, Arnold and Thelma, in 1929. Two years later they added another set of twins – Ronald and Lloyd. They now had four children under the age of three years. Then came a well deserved break of six years before Rita arrived in 1937.